VackerGlobal provides various tests & analysis for life sciences, pharmaceutical and food segments which involve manufacture, storage and transportation of highly sensitive products generally known as Cold Chain systems. What is Temperature Mapping Study, Validation & Qualification? In a brief, temperature mapping study is the process of analyzing the uniform distribution of temperature and humidity across the controlled area under various practical conditions. The study is carried out to check and that the entire area inside a thermally insulated chamber is at the specified temperature at all times. This is carried out mainly for the storage facilities such as cold rooms, warehouse, refrigerator, vans for storage and transportation of medicines, vaccines, foods etc. Please see our video for a detailed understanding. Walk in chillers and freezers for storage purposes. Cold rooms used for storage of medicines, typically between 2 to 8°C for medicines. 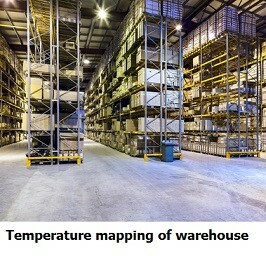 Warehouses for storage of medicines, typically between 15 to 25°C and under 65% RH. Refrigerators for keeping medicines, vaccines etc. 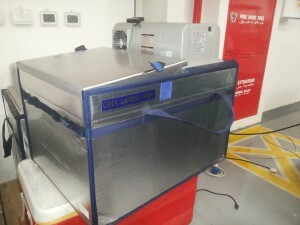 Freezers for keeping plasma, medicines etc. Vans and Reefer trucks for transportation of medicines, typically between 2 to 8°C or 15 to 25°C. Autoclaves and stability chambers which have to generate controlled temperature and humidity. Temperature Qualification (and humidity if required) is a bit elaborate process which also involves mapping study as one part of the process. These series of tests also need to be done for any sensitive areas such as warehouses, refrigerators, freezers, medicine rooms, vehicles, reefers, boxes, containers etc. especially for storage and transportation of medicines and food. The process of Temperature Qualification involves complete identification of entire equipment involved inside the enclosed area including chillers, sensors, evaporators, cooling units, dehumidifiers etc. and study of the complete system under various conditions. Empty condition without any loads inside the storage area. Fully loaded condition with 100% loads within the storage area. 60 to 70% loaded condition, in which the area will have loads up to 60 to 70% of the storage area. within limits after a power failure without opening the door. Door opening conditions to find out how long the door can be opened without affecting the interiors. All doors are tested separately. Startup verification process to find out the duration required to achieve the desired cooling upon startup. 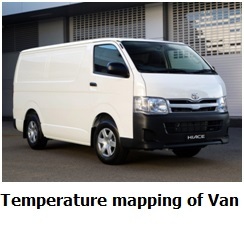 The process of temperature mapping study is carried out as per the protocol issued by us and approved by the client. Apart from the various details of the subject being qualified, the protocol indicates the methodology of various tests to be carried out. While writing the protocol, the usual practices of the customer are also considered and tests are performed accordingly. eg. If a vehicle is always used at around 50 % load, it is ideal that tests are also carried out at 50% loaded condition also. If a vehicle is qualified for 2 to 8 Degree Centigrade, it is meant that the entire storage area of the vehicle will remain within 2 and 8 Degree Celsius with the current set of cooling unit, evaporator, sensor, controller etc. Also, critical conditions such as the duration for which the door can be kept open etc. will be identified and corrective actions will be indicated in the final report. This process will qualify your Warehouse, Cold Room, Chiller, Vehicle etc. for storage and transportation of Food, Medicine etc. 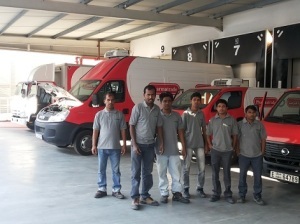 Vacker Group carries out these services throughout all Middle East countries such as the United Arab Emirates, Kuwait, Qatar, Oman, Bahrain, Kingdom of Saudi Arabia, Iraq, Jordan etc. In the conventional method of temperature mapping, we use normal data loggers to record the data. After the tests, we remove all data loggers and download the data. The disadvantage is that if there are excursions, we will not notice until we download the data. In the case of corrective actions, the customer has to undertake the corrective actions and carry out the complete test once again. This will result in huge expenditure on cost and time. In order to overcome this problem, we can use wireless data loggers. We will be using wireless monitoring systems instead of data loggers. There are different types of wireless data loggers are available. We also have Bluetooth data loggers for the same purpose. The data transmission is in real time through a local server or a cloud-based server. We can monitor the data in real time and in the case of excursions of temperature or humidity, it can generate alerts. Upon receiving alerts, the customer can look for problems and can take corrective actions. We can start retesting upon completion of the corrective actions. The data loggers can remain in the same locations while undertaking corrective actions. Thus a huge amount of money and time can be saved in the process. We offer validation of software of temperature &humidity monitoring systems. For may clients, there is a requirement to validate the software after installation by the pharma distributor in their warehouse, cold room etc. We carry out such validation on software supplied by different manufacturers. Also, we offer validation of software for the temeprature tracking system for vehicles. Please see more on our services for software validation. Data Loggers for monitoring and recording of temperature and humidity. Wireless, Real-time Temperature monitoring over the internet with Phone, Email and SMS alert. Packaging products covering Thermal blankets, insulation sheets etc. Insulated passive shipping boxes with gel packs. Temperature mapping & Qualification of shipping packages & boxes. Thermal Package testing for testing the thermal withstand capacity. Thermal Profile study for understanding the thermal behaviour under different conditions. Thermal equipment calibration and certification on a periodc basis. Package Integrity testing to test the thermal behaviour of packaging materials. Validation of softare for temperature monitoring systems. 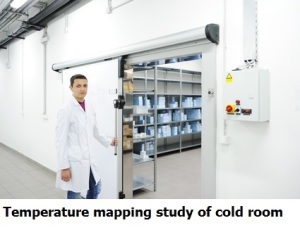 HVAC validation for Cold Chain warehouses and cold rooms.